I am not a good bowler. When I taught religious school, I used to lead services with lots of music for kids. This was one of my favorite things to do, and at the beginning of every school year, I had to teach kids some prayer basics. This did not involve how to learn prayers; kids absorb those and learn about prayers all the time. This involved learning to be ready to pray or how to find a personal prayer space. Imagine you're in a room with 15 -100 wiggly kids. Age range 5-10. OK, everybody. I want you to move away from the people next to you. No touching. (Dario, stop touching Rachel. 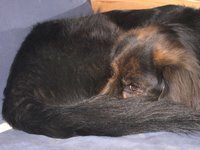 Janey, that's enough) OK, now, close your eyes. No peeking. Imagine your favorite place. It's a playground, or the beach or your backyard. Everybody have a place? (dozens of little faces screw up in concentration, eyes shut.) Your friends and family are near you, but not touching you. No touching! Focus on how special that place is. How inviting it is. How comfortable you feel there. Think about the good experiences you have there. Is there where you learned to go down a slide? Go swimming? Play with your dog? How do you feel in this place? Happy? Peaceful? Quiet? Loud? Ready to think about important stuff? (shh. no talking to anyone else about this.) This is your place. You're alone here, to talk to G-d.
OK, everybody, open your eyes. When we pray together, that's exactly the place you want to get to. The still, special place, where you feel good and where no one is bothering anyone else. Everyone ready to go back to your special place? Now we're ready to start praying. Why do I mention this? As an adult, I bypass this little exercise and head right into my appropriate "prayer place" when I go to synagogue or recite a blessing. Most prayerful people of all faiths, as adults, know how to do this. On a daily basis, though, we often need to step away from the stress, the tension and the anxiety dreams. (I've had some whopper anxiety dreams. Whew!) Today, for the first time in a while, I tried to stop and think of my special place. What is it, these days? You know, I don't know what it is. The last one I can remember, several years ago, was sitting and spinning on the front porch of my old house in Durham, NC, with Lucy, my first dog. 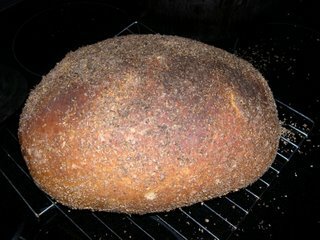 Lately, I've been baking a lot of bread. I find this calming, and since the No-Knead Bread Recipe changed my bread making life, I've been making all of our bread at home, not just the challah. So, how do you take a step away when things are stressful? Any hints? Note for non-knitters: * * means rep between asterisks. Remember this photo? Well, right after I wrote that last blog entry, I got a few design leads to knit and got busy with some writing and editing work. 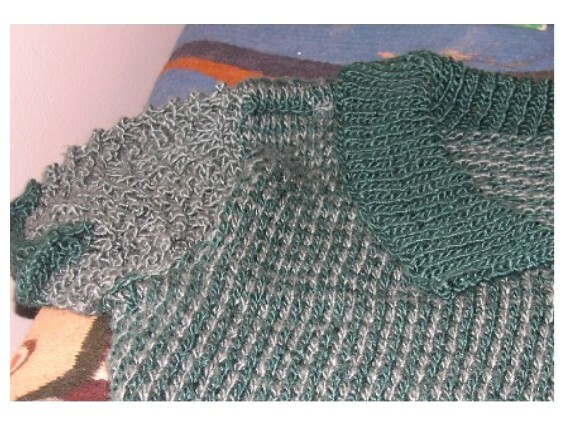 I mentioned to the professor that I thought some yarn that I'd left out was getting sunbleached, and he suggested a pattern that starts with: leave 2 skeins of yarn out in a sunny spot for 6 months to a year...then the project would use those "lighter" skeins as an accent edging or design feature. 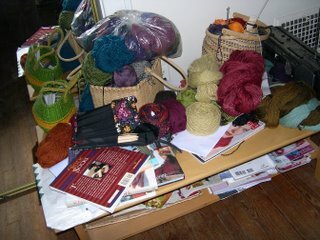 That's when I decided to tidy away some yarn. Plus, if you put it away, there's room for the new yarn, right? 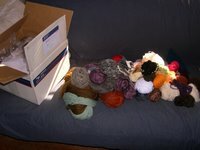 I sorted out this yarn to be put away. Yes, it was all on the coffee table. The end result was certainly not an empty expanse of coffee table, but what can you expect from a person who likes clutter? I'm just saying, for me? This is impressive. Meanwhile, Sally was dodging foot traffic on a dogbed, obviously thinking, "Geez, Joanne, could you stop monopolizing the couch? We've got to get some sleep around here!" In other news, we had more dinner guests over on Friday night. It was a good time! My menu: Vichyssoise, (also called Potage Parmentier or Pureed Potato Leek soup) roast chicken, roasted carrots, Jerusalem artichokes and Bolivian sunroot(last two from our garden), homemade challah, a big green salad, and Zinfandel or sparkling grape juice. For dessert, chocolate banana mousse, pears, and passionfruit. Lest you think that Kentucky grocery stores have gone big city in the produce section, the professor bought me two pounds of passionfruit on his collecting trip to Florida. I've been savoring them ever since. As we speak, I'm attempting to make my own Ceviche, but we might not get to try it until tomorrow night's dinner. Tonight? We're driving the 70 miles each way to Nashville to go bowling with a new young Jewish couples group. We're not even all that fond of bowling. This makes us sound like a nature documentary: rare species needs to travel a long way to socialize with its own kind. There's a lot of waiting in this profession. There's the time for thinking and writing. Then, there's the submission time. How long will it take for an editor to accept or reject your article/essay/pattern/book/whatever? Then, even if it's accepted, it might be another year before it's published. You might have to wait a long time to get paid, too. So, despite all those people who seem to think this work sounds heavenly--you can't believe how many people want to become a freelancer, especially when I'm standing at the post office to mail off a big submission, but if the line is long, I tell them about the business end of it all, and the waiting. That's when they think, "This lady is crazy! They tell me, gee, they didn't know writing was so complicated and they turn away, back to waiting and averting their eyes. The business aspects take up about 50% of my time on average. ..invoices, pitching articles, contacting editors, proofreading things, etc. So, even though I like to write and design, I find the business aspects and the waiting the hardest part about freelancing. I've been waiting for a lot of unnameable things lately, and the waiting continues. I know how Vladimir and Estragon, aka Didi and Gogo felt sometimes. Where the heck is Godot? Do you have waiting in your life? Are you infinitely patient? How do you cope? The finished toe-up socks in the mysterious yarn. 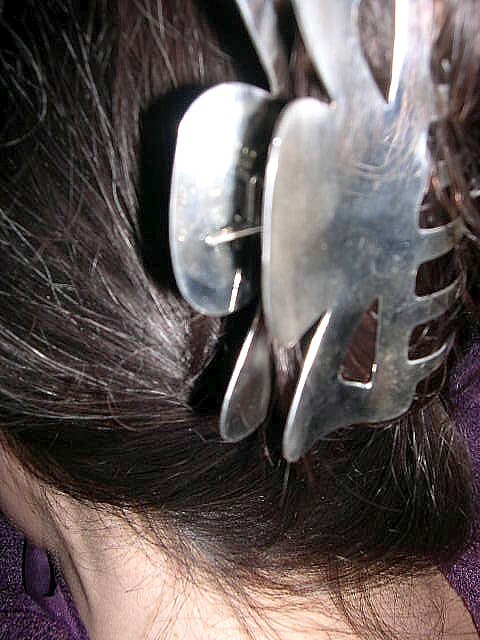 It's my own design, I liked the challenge, but I haven't yet worn them. They have a sort of slouchy lace appeal up top. I haven't decided yet if I want to write up the pattern. 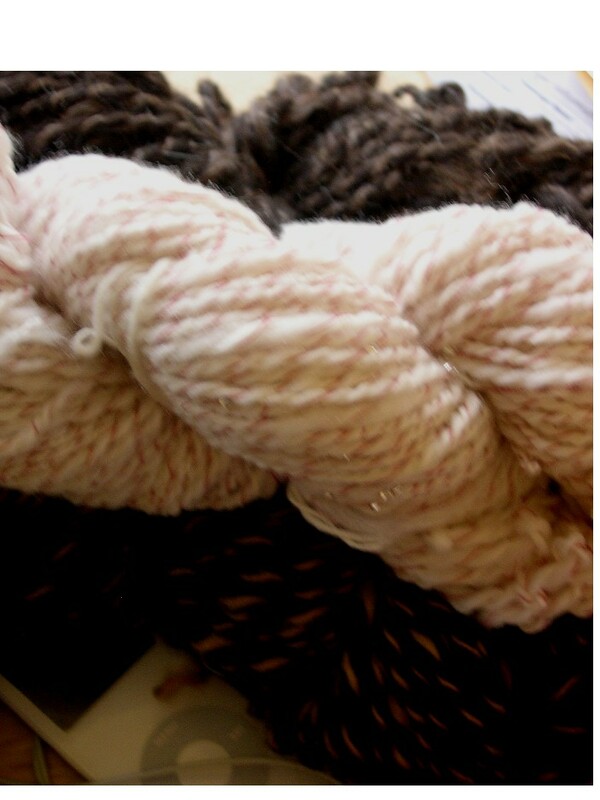 Here is a close up of the actual yarn colors. 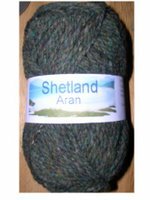 Really, if you know what the yarn label might be, let me know. I'm curious. The beaded handspun is now finished, and we're lucky to have a bright day for photos. 240 yards of two ply Cormo, plied with a pink cotton thread and little glass beads. Shiny and pretty, and I'm much faster at threading beads now than I used to be. Hint: Put them next to your computer, and see how much beading you can accomplish while....waiting.... for the work emails you're expecting. See how much waiting I've done? a lot. Gasp! He said, with a big grin. Do you think...it's-- moths? (haha) Dear Herr Doctor just caught 60 buckeye butterflies on his research trip. 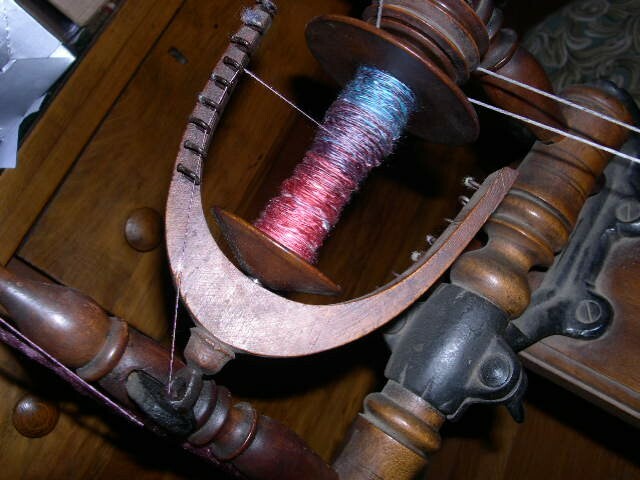 Professor's note: There are hundreds of varieties of butterflies and moths, of which wool moths are a very small number. No, these huge tears in the lightweight Scottish wool throw weren't done by moths. We strongly suspect Harry the dog. 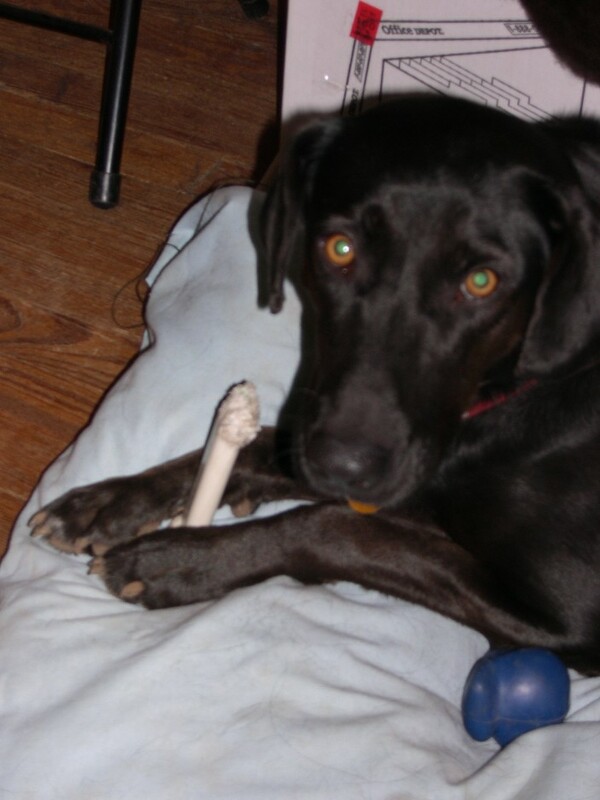 He may have been burying a nylabone...but this remains a mystery. Luckily this blankie wasn't expensive and we aren't (ahem) too ripped up about it. Other mysteries have taken up my waking hours. 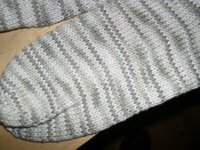 These toe up socks, for instance, are knit out of some lovely yarn...in a poor photo. It appears to be mercerized cotton? in a white, sage green, pale blue stripey blend. 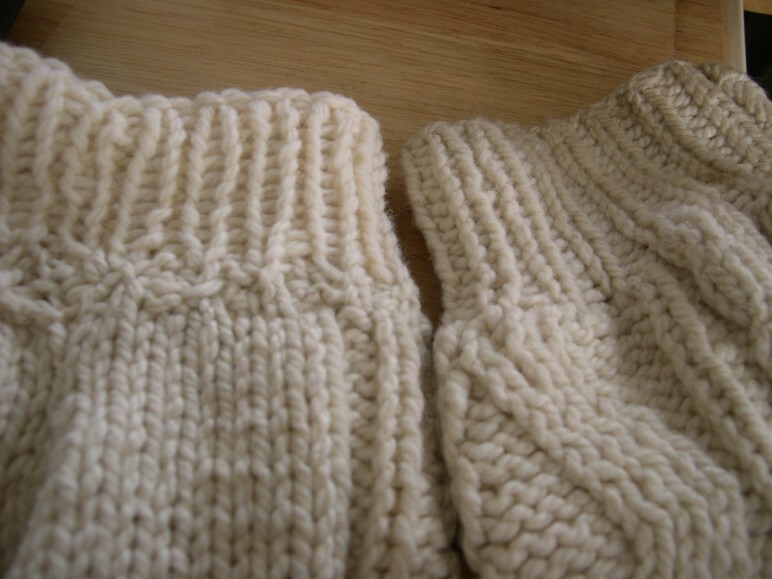 It knits up at 6 sts to an inch on a 2.75mm. I got it for a $1 a ball a few months back at Picasso's Moon in Sarasota, Florida. I'll definitely go back there, it was a great shop. It was a dollar a ball because it didn't have a ball band that told me what kind of yarn it was. Anyone who might be able to solve the mystery? Please leave a comment! On Friday afternoon, I rushed to tidy up our house and make Shabbat dinner for our guests. The phone rang while I vacuumed. I ran to answer it, since it was still technically business hours. Another (unfortunate) mystery...this time, an ascerbic elderly woman's voice, with a European, perhaps German accent, brusquely commenting on my religion, expecting I'd convert to Christianity, and then hanging up on me. Her number appears to be unlisted, this is the second time she's called. The first time, she told me I came from hell, and was going to hell. Next time, I'm calling the cops. Obviously something I've written has hit a nerve there, but this unpleasantness has to stop! As to dinner, no mystery there--roast garlic chicken, roasted potatoes, carrots, Jerusalem artichokes, homemade challah, dilly beans, pinot grigio and apple/blueberry crumble. We enjoyed the meal and the company. On Saturday, we heard a great lecture at our synagogue in Nashville from one of my grad school professors, Dr. Jack Sasson. 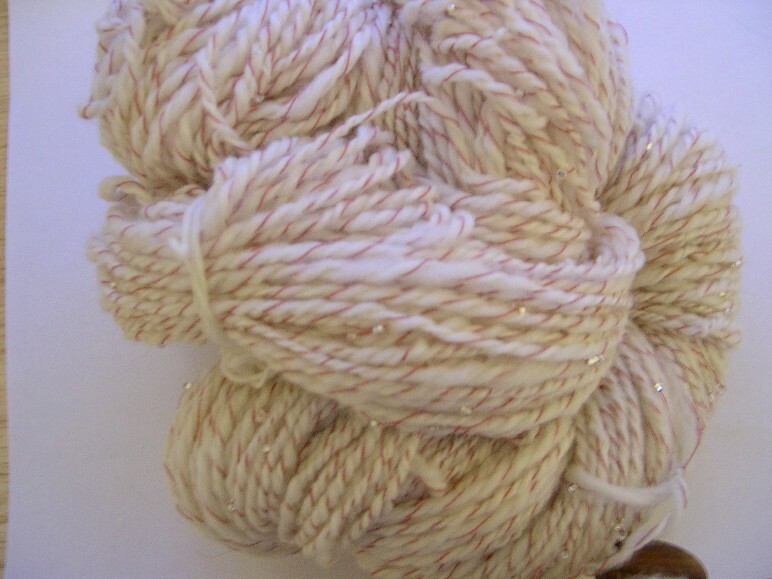 I've spun up some of the Cormo wool with beads and pink thread. In the background, two skeins of brown wool, one plied with llama and the other with camel. The gray weather doesn't encourage good photos today, so these yarns' appearance....guess what? unless you click on the photo to make it bigger... it'll remain a mystery. On my iPod while spinning? uhhh, here goes...The Cereal Murders by Diane Mott Davidson. You've got it this time...ready? A culinary mystery. I've been writing patterns and a pitch for an article or two, but even work's been very quiet. I've read a pile of books this week, and watched an entire DVD mini series while knitting. Hint for other bored folks without friends out there: The Far Pavilions is a better book than movie, even though it has Amy Irving in it. I Love Huckabees was a pretty funny social commentary, complete with nihilism and hints of Islamic philosophy. Very existential. Worth borrowing from the library while knitting. 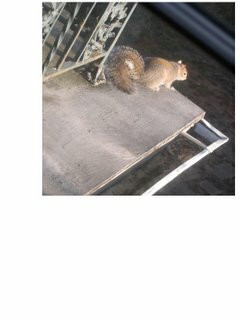 I started off with a photo of a squirrel that I took from my office window. I think this is the only squirrel my dogs haven't treed this week. They are barking, hysterical squirrel loving fools. I'm afraid that I'm barking instead of talking at this point. I understand the squirrel attraction, and I'm absolutely enjoying the daily walks. I think it might be time for some human interaction. Please, leave a comment. Keep me company! Caption: (Yes, these are my housemates.) Hey baby squirrel, want to come over here? so, is that a big deal? I've been freelancing for 4 years. At first, I denigrated myself...here I was, this "educated" person in a smallish college town, and I couldn't find a job. No one had to make me feel bad, I did that myself, although I had some humdinger comments at interviews that did make me feel bad. I was offered jobs, that wasn't it. I wasn't offered career oriented jobs. Sure, I could teach part-time or work as a receptionist. I was offered those gigs, which would pass the time but kill my future career goals. I wasn't ready at 30 to throw in the towel and say, "Absolutely, I gave up my tenure track community college job in upstate New York to do this rinkydink job because here, my full- time job is biology professor's wife." I decided there had to be something better for me. I started freelance writing, designing and teaching and doubled my income every year, but it still wasn't much of a living. In 2006, I hit 5 digits. I earned about one third of what I earned teaching. Yet, in October 2006, I accomplished something huge. 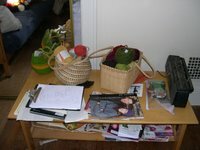 My first article was published in Vogue Knitting. To me, this was a tremendous moment. Like having my name up in neon lights or something. I was bursting with pride. "So, uhh, is this a big deal? Should I be impressed?" Woosh. That was the sound of the wind leaving my sails, let me tell you. This Socks that Rock club thing reminded me of that Woosh moment. Since this is a quiet day, I'm going to show you some things that Yes, I think are big deals. The teal sweater, above, that I'm modelling in the not so great photo is 100% silk. 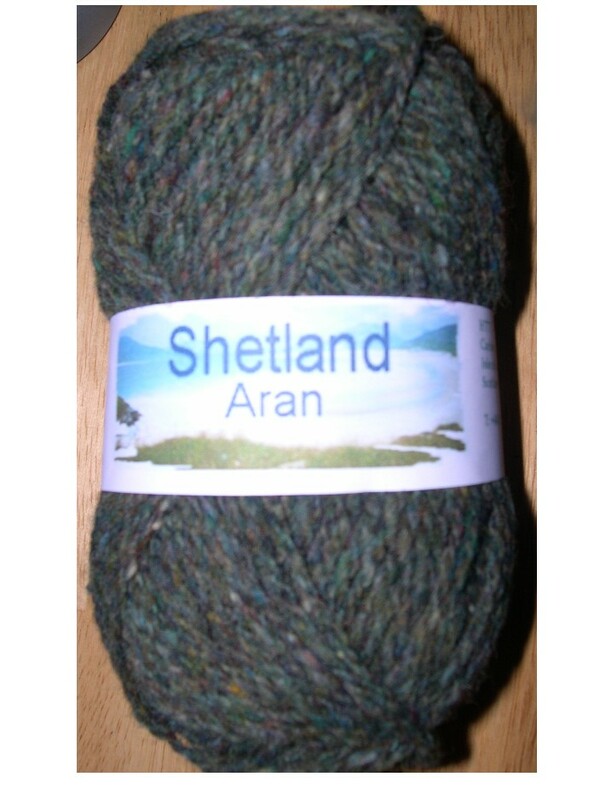 I bought the yarn for around $100 on sale. It's anny blatt silk, and the kind of yarn is so out of date that I could not find it online. I designed this. 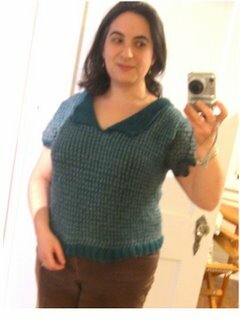 Definitely one of a kind and looks better than the photo: Two color slip stitch body, feather and fan lacy scalloped sleeves, and a sailor collar. I hope to wear this to my brother-in-law's wedding in May. (that's the dogs' Uncle Ben, who gave us the pink fuzzy ball, for those of you keeping up) It fits me like it was made for me and I know no one, anywhere could purchase this in a shop. I did this. I'm a knitter. 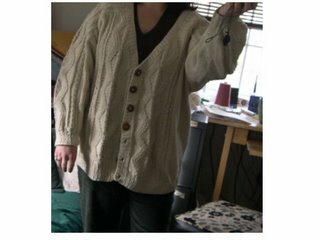 About 11 years ago, my mom made this cardigan for me. I love it. I wore it when I was teaching in inner-city DC, in suburban Reston, VA, when I went to grad school in North Carolina and when I taught in Buffalo. This sweater's been around. 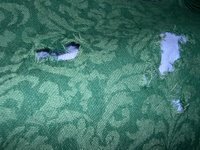 Sadly, over time, one of the cuffs frayed. This is because I loved the sweater. Not because I chewed on it or anything like that. My mom bought me a skein of matching yarn to fix the cuff. 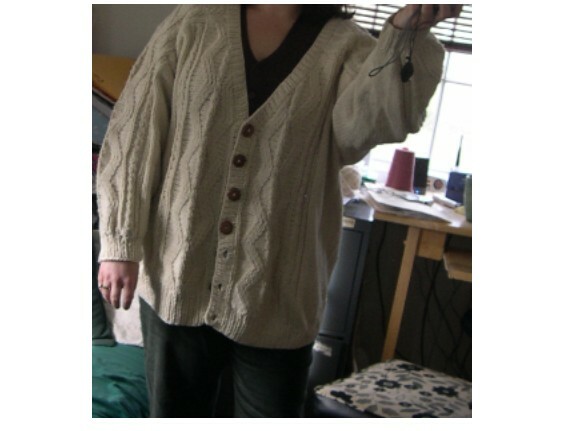 I mentioned the sweater in this article, so the thing has been needing a fix since 2004. Today, I fixed it. 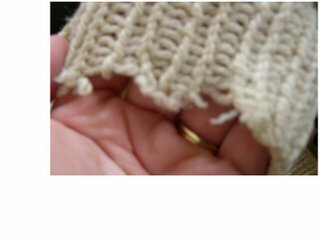 The sweater will never be new again, and the cuff looks new. That will change in time, but it's like I've saved an old friend through fixing this. My mother knit this incredible sweater--and, let me tell you, she's a knitter. 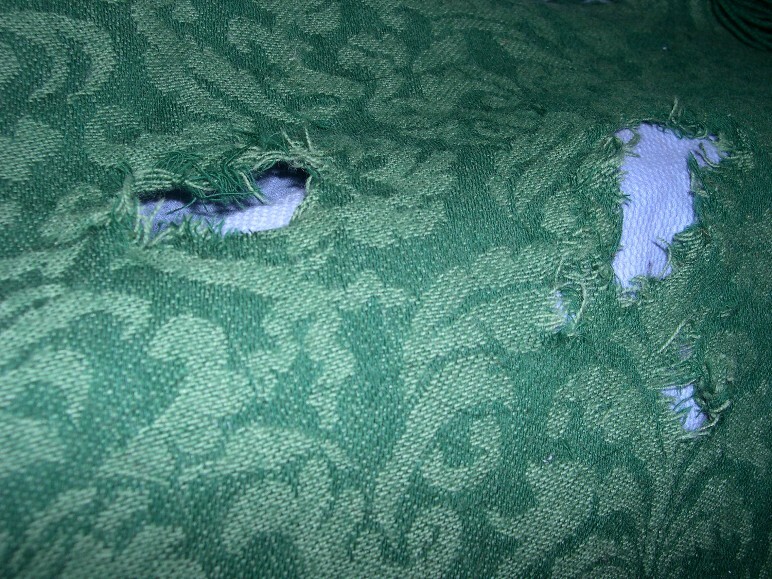 I fixed it, kept one more sweater for use instead of throwing it away or turning it into a blanket, because I'm resourceful and skilled. I'm a knitter. 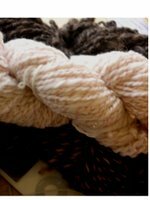 This story that the Yarn Harlot related today, about a successful woman owned business that was told, "gee, you can't be making this much money from knitting"--well, it got me in the gut. I've heard it before. There's a scary truth for you. You can be writing for international newsstand magazines, designing both one of the kind sweaters and widely distributed patterns, tutoring students and attracting notice, but you know, like, is that a big deal? I mean, it's only knitting. What it sounds like to me? Well, it's only a woman. Yeah, like that--and I know a lot of us have heard that one before. The kicker? We've got a WOMAN in charge of the U.S. HOUSE now. 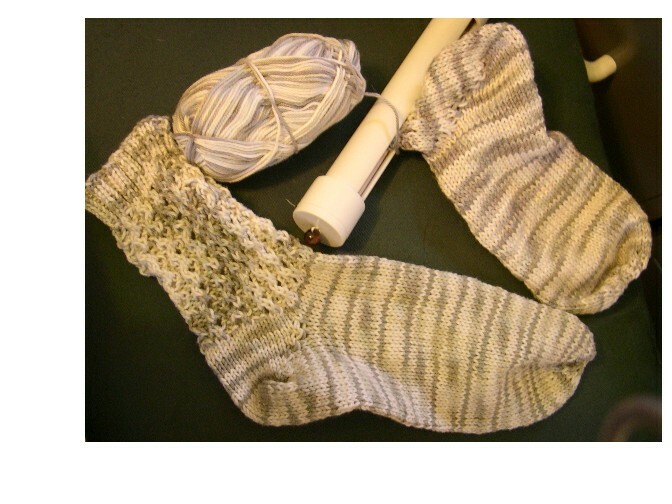 Oh, and I hear that one bank is going to get a heck of a lot of socks, or at least hear it from a lot of us knitters. Read this! We are knitters. We are women. We have power. Hear us roar! Thanks for the birthday wishes! It would appear that I only got one on the blog (thanks, June) but actually, I've had just a birthday season...days of b-day presents, emails, many good wishes and treats. I also ate a lot of cake! 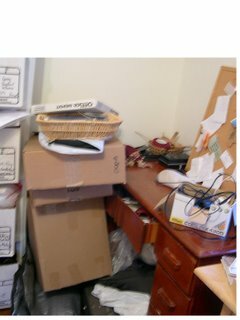 I took a box and emptied off my desk area, kicking up lots of dust, coughing a lot, and cleaning and clearing away dust and clutter. I reassembled the desk with the basics. It is startlingly clean. Hardly know how to handle it. 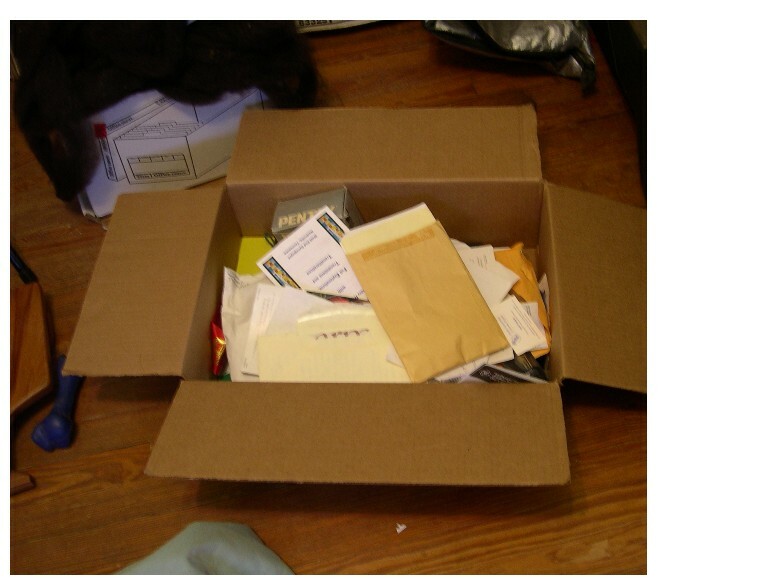 I still have this box full of stuff from my desk to confront. I did recycle a lot right away, so this box has all the hard decisions in it. 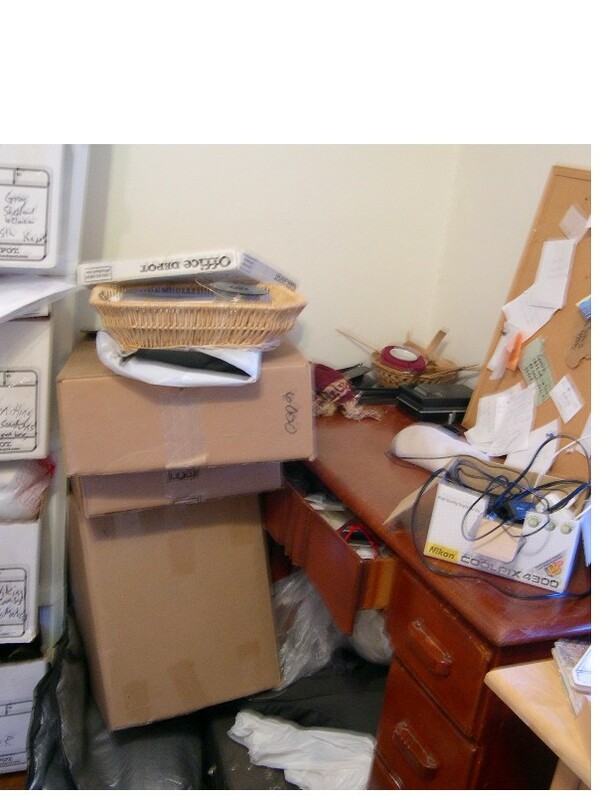 I placed the box on the floor for the photo (office isn't all that big) and you can see some wool, a rubber dog bone, and a part of a dog bed just keeping the box company. We've got a lot of important "tools" in this here office. Then I considered something upsetting. 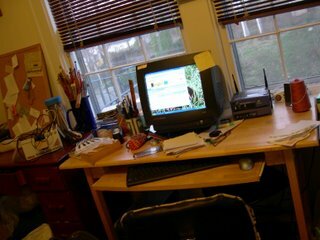 Now that I've got the clean desk, the clutter near the desk and the coffee table look bad. Uh Oh. This photo is out of focus because I was shaking or something. Too much mess was blinking in red neon in my mind. Cannot cope with all this! The truth is that I can cope just fine. I've been working creatively in this for months. Now, I wonder, will I be able to work with a clean desk? What was in all that clutter that I used every day? What would happen if I just pitched the stuff in the box? Do I need any of it at all? Should I even consider digging out the rest of the office space? 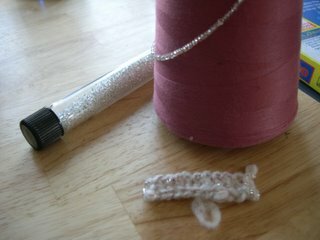 Beads are small. They get everywhere. 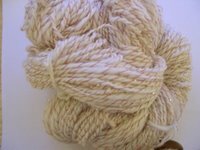 You need a lot of beads to create 200+ yards of beaded handspun. Kicking up this much dust, reshuffling one's whole workspace and then trying to string small beads? Headachey coughing. 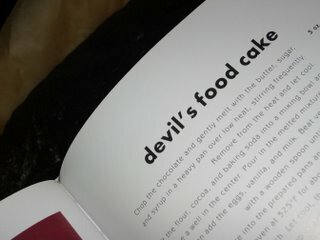 I am making my own ooey gooey chocolate cake. Here it is, cooling. I propped up the recipe nearby so you'd know what the brown blob there was. 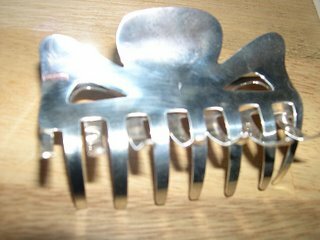 My parents and Grandma sent me this basically fabulous silver butterfly hair clip. Not only is it gorgeous and a butterfly shape (married to a butterfly geneticist, get it?!) but it mostly copes with my big hair. Since it is 66 Fahrenheit and drizzly right now, I've got the big hair. It's January 5th, for heaven's sakes! I'm missing frost! and snow! Give a girl's asthma snuffles a rest...that's right, this is the only b-day image of me you're seeing today. Hair doesn't have sniffles and a cough. Dang virus. Dang mold allergies. Dang heat wave. At around 7:30 this morning, I was greeted by this at my front gate: No, let's be honest. I heard banging. Sally started her high-strung panic barking. We all rushed to the windows. First I asked, "What are you doing here at my house?" The municipal utilities workers told me there's a water leak on the street right in front of my home. A leak so small that they can only fix it today. A leak so small no one in my household noticed it. "Oh," the husband says, "I saw them spray painting on the street last week." 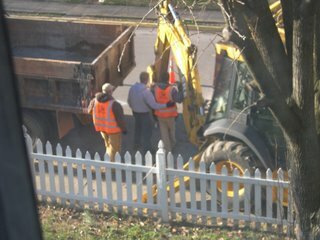 We thought it was to locate the gas lines, since a car accident took out a utility pole a couple of weeks ago. 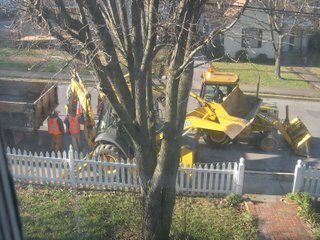 Then the utility workers, based on the gas company's careful instructions as to where the gas lines were? They hit a gas line. Huge fire - A block from our house. Luckily, no one was hurt. Just a 25 foot column of flaming gas, some diverted traffic, a lot of sirens, some house evacuations. Not mine though, so no biggee, right? Today though, I am gifted with banging. This is not the drip drip drip of a dripping faucet. This is intermittent asphalt banging and animated discussion on the street. 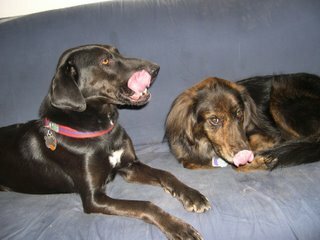 I walked and then crated the dogs so they'd stay calm in this ruckus. I hoped they wouldn't hit a gas line again. Yes, I'm a mean person. Horrible. Obviously deranged, asking when they might finish up, asking why no one notified me beforehand so I could have worked during the weekend, that sort of thing. Before I even identify myself as an outsider, they know it..in fact, people think my east coast Northern Virginia accent means I'm a Yankee. (no sir, that's not what it means, but I won't bore you with Civil War history.) Anyway, I imagine they're all saying, "Yankee Witch!" Inside, I'm saying, "Please, please be quiet so I can just finish this knitting related article by the deadline. Please." I imagine (GASP!) a completely blank magazine page, one of those magazines we fibery folks can't wait to get in the mail... "Please. " I've written this during a lull...but now Sally's barking again. It's going to be THAT kind of day...at least until lunch, when they say they're going to leave...right.